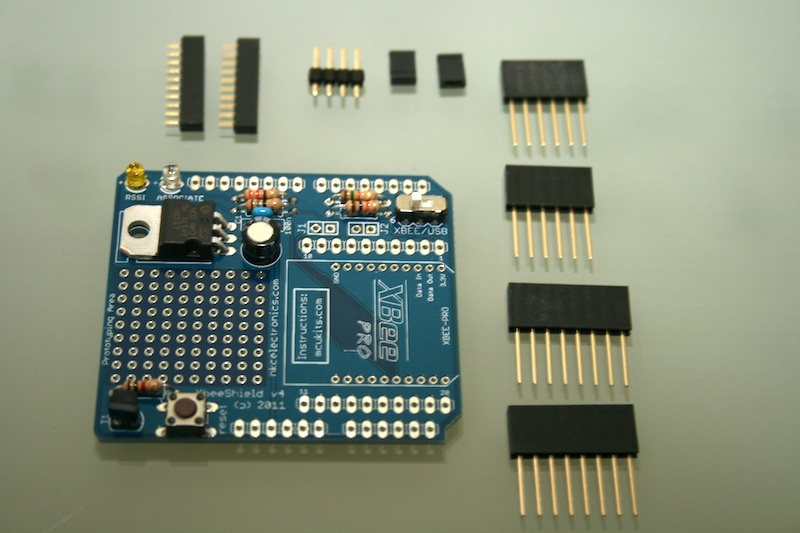 The NKC Electronics XBee Shield V4.0 KIT is an enhanced version of the original Arduino XBee Shield. 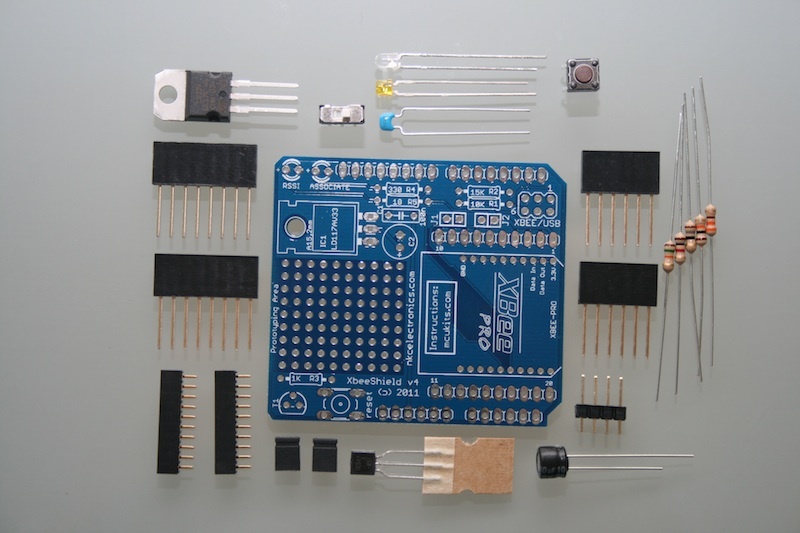 It is sold in a DIY kit format and it comes with all the components required to assemble a full XBee Shield that is pin-compatible with all Arduino format compliant boards (Arduino, Freeduino, Seeeduino, chipKIT, etc). V4 includes some new features, like a switch to select XBEE or USB instead of jumpers. 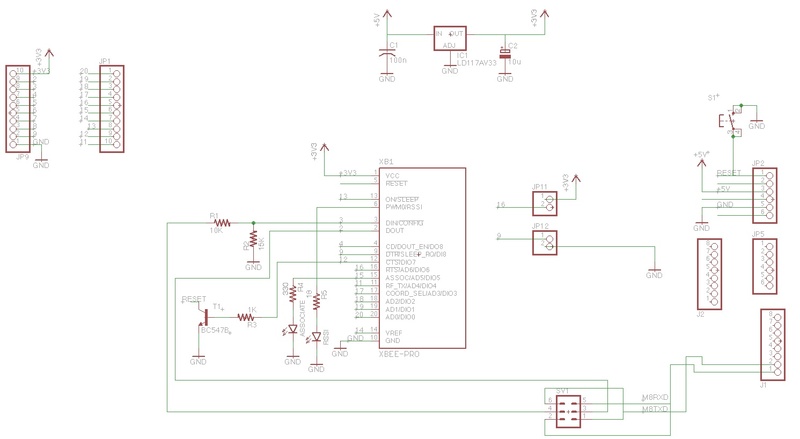 This switch, re-routes RX and TX at the same time, so if for some reason, you still need to switch RX to one position and TX to the same position, then solder a 2×3 male header instead of the provided switch, and use jumpers to select the position you need. There are 2 jumpers. J1 and J2 are for upgrading the firmware on the XBee module. Leave open for normal operation (both J1 and J2 open). 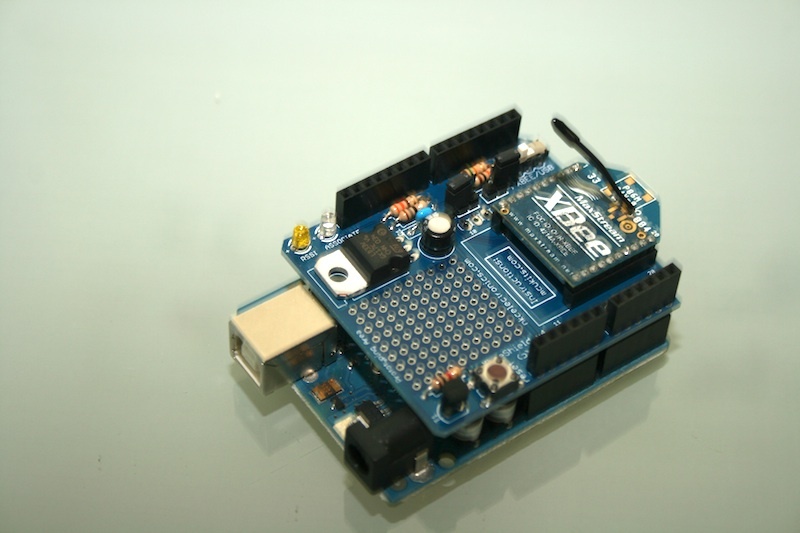 The XBEE/USB switch is used to route the RX and TX signals from the XBEE module to the Arduino board. 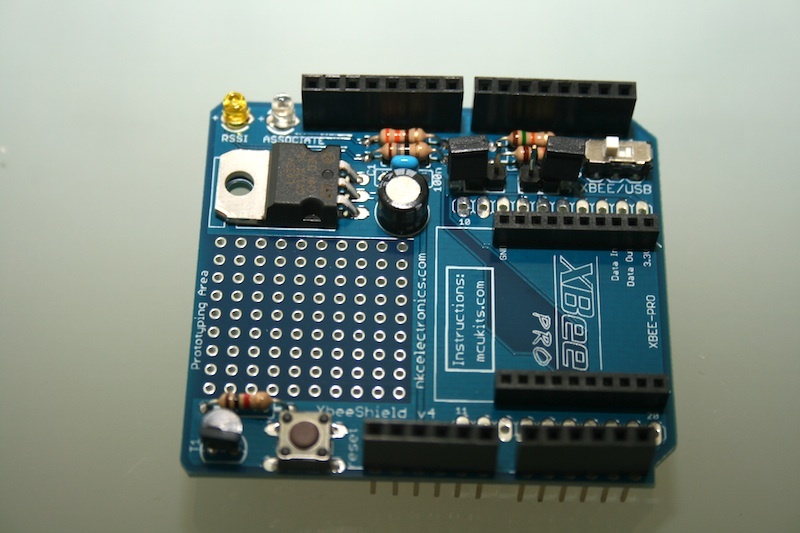 Select XBEE position if you want to communicate the XBee module with the ATmega chip on the Arduino (or compatible) or PIC on the chipKIT board. 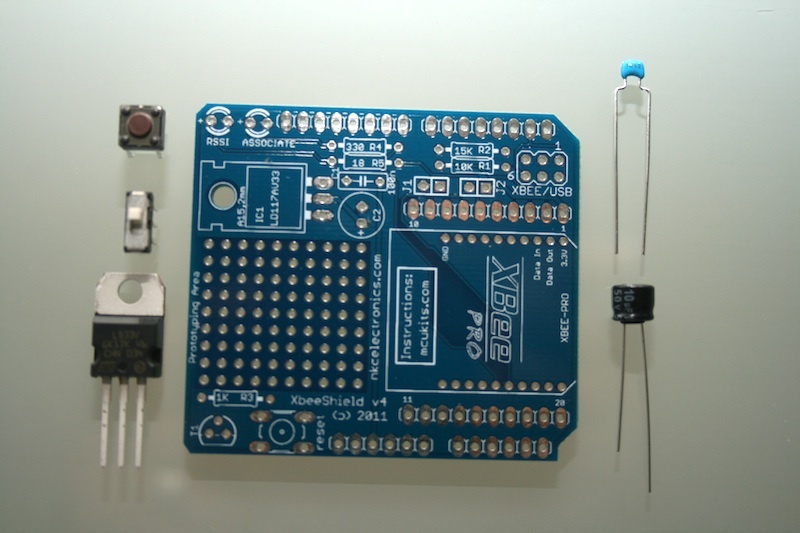 Select USB if the board does not have the microcontroller installed and you want to use the USB interface to communicate the PC directly to the XBee board. And this is the final picture of the XBee Shield V4.0 assembled and ready to use. 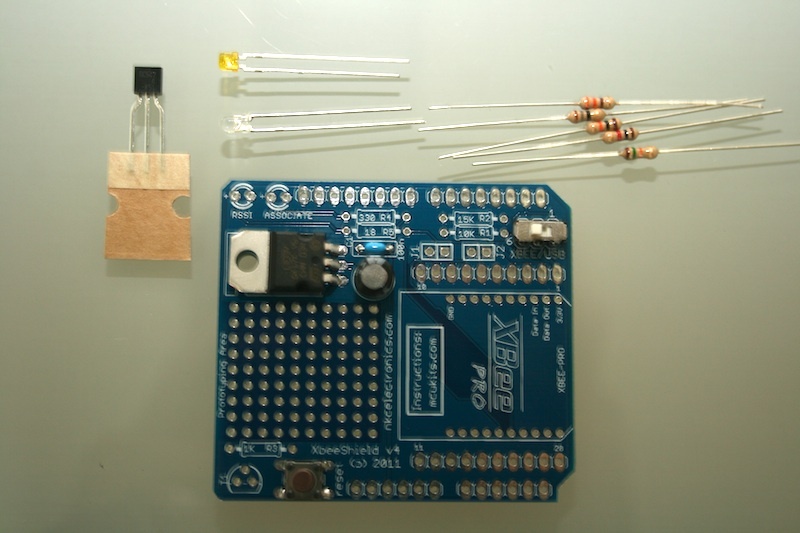 XBee module is not included in the kit and must be purchased separately. You are currently browsing the MCUKITS blog archives for November, 2011.